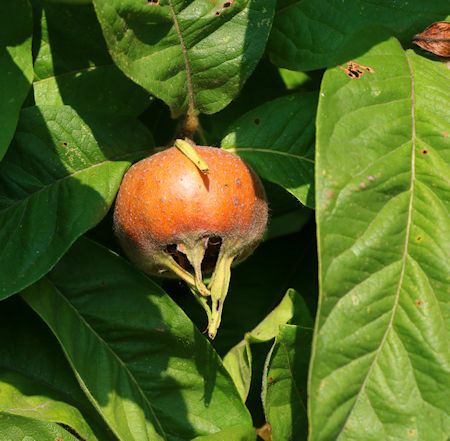 Mespilus germanica (Medlar) : MaltaWildPlants.com - the online Flora of the Maltese Islands. Shrub or small tree up to 6 m. Leaves 5-12 cm, lanceolate or oblanceolate to obovate, pubescent, but sometimes glabrous above, entire or serrulate towards the apex. Flowers 3-4 cm in diameter. Sepals 10-16 mm, linear-triangular. Petals white. Fruit 2-3 cm, brown, pyriform to depressed-globose. S.E. Europe, extending to Sardegna and Sicilia cultivated and naturalized in C. & W. Europe.